We’d love your help. Let us know what’s wrong with this preview of Positive Discipline for Teenagers by Jane Nelsen. Over the years, millions of parents have come to trust the classic Positive Discipline series for its consistent, commmonsense approach to child rearing. Inside, you'll discover proven, effective methods for working with your teens. 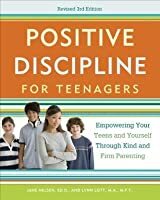 To ask other readers questions about Positive Discipline for Teenagers, please sign up. Some good info on being positive and communication, but I didn’t see any discipline in this book and overall I just found it confusing with a lot of what not to do and not so much of what TO do. I am a psychotherapist working with teens and families. I give this book to almost all of my parents at our first session. I often hear back that after reading the first few pages, they felt a huge sense of relief. I highly recommend this book for every parent! I didn’t really get this book. There’s no advice and no ideas on how to discipline in any way. 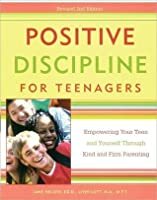 Why is it called positive discipline? If you’re looking for a book to tell you what you’re doing wrong (yelling, not listening, reacting too quickly or without all the information) then this may be helpful. If you are looking for ways to help with what you’re doing wrong, this is not the book for you. This book leaves you with the unrealistic idea that if parents would just be respectful and willing to talk out/negotiate every little thing with their teen, everything will be fine. "Move over to the co-pilot's seat so you can have a positive influence on your teens without trying to run their lives." There's nothing in here about discipline. I like the positive approach. I also learned a lot about how to empower and not enable or rescue my teen. The first part was quite good, and there was some useful information about helping the teen recognize their emotions, a table of personality types at the end (which probably should have been way in the beginning), and a few other parts I found helpful. I liked the reminders that your relationship with your child is precious and the most important thing. Having said that - it's also important to try to help your teen make good choices. I do not believe that letting them do whatever they want and j The first part was quite good, and there was some useful information about helping the teen recognize their emotions, a table of personality types at the end (which probably should have been way in the beginning), and a few other parts I found helpful. I liked the reminders that your relationship with your child is precious and the most important thing. Having said that - it's also important to try to help your teen make good choices. I do not believe that letting them do whatever they want and just talking about things is the best (or a safe) approach in every situation for every child. The section on scary behavior was spectacularly unhelpful. Telling me not to worry so much is not really going to keep my kid from getting pregnant or get an STD or get rolling drunk and accidentally kill herself. I have one daughter who is clearly at risk for all these things, and she's the reason I read this book. I don't think I got a lot of help with her problems. I did actually apply the principles in the book and the scary behavior quickly escalated. Some kids do need a lot of guidance and sometimes freedom has to be scaled back if it's apparent that the kid cannot manage things well - whether the child likes it or not. More information on teen brain development and the stages we can expect to see would have been helpful too. This approach to parenting is a complete paradigm shift for me. I appreciate Rachel sharing information about this author. I grew up with controlling parents and know first hand just how well that works out - you'd think I wouldn't repeat it, but then it's all I've known. This book makes sense and I know it will be hard to implement, but I think Rachel is right. This is how we should parent. I'm very intrigued by the parenting ideas in this book but am unsure of how they will translate into an older child adoption. The book assumes that the parent has already raised their child for 13 years. We're adopting an 11 year old and will be starting from scratch. Will some of these ideas work with her as well? It will be interesting to see what happens. I was surprised at how much I enjoyed this book. I knew that the ideas would be great. Jane Nelson and Lynn Lott always have great tools and suggestions. But this book was so much heavier on the "whys" than the other books in the PD sereies that I really got a lot more out of it. I will definitely be revisiting this book in the years to come. Very interesting book. It helped me adjust my perspective on parenting teenagers. At first the book seemed too "easy" on obnoxious behavior, but I've been amazed how the calm approach really does work better than the controlling approach! This was the first respectful book I've read on parenting teens. The author believes in the fundamental dignity of children, adolescents and adults, and gives useful advice, placing responsibility for the relationship where it belongs-- with parents. i know kena is only twelve, just prepping myself. some good stuff, some not so good. This is an excellent book, full of great insights and suggestions. A must- read for anyone with a teen!! I'm going to keep it around and read it again! Good but mostly aimed at families where the children aren't TOO troubled. Not totally realistic for me but still worth reading with some good suggestions. 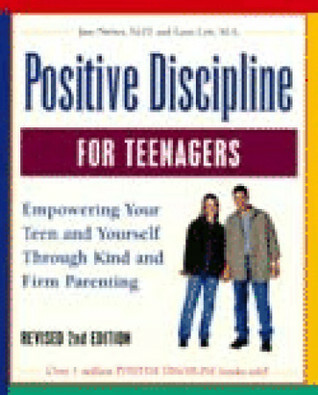 Another in a long line of books attempting to make it easier on parents to raise teens. Not enough "get to the point" here. I just couldn't slog through another book like this. If you have a teenager, you should read this book. It will bring welcome insight, relief and guidance for this phase in your and your child's life. This was the companion book to a 6-week parenting course I took. Very helpful and has improved relations greatly between my tween and I! This book will help you understand the mind of the teenager. Excellent. I highly recommend this book for parents of teens. Telling & guiding us on how to handle our teens who is learning to be an adult. Very informative & important to all the parents. Great insight into parenting teenagers with lots of practical, useable advice. I know this will help me be a better parent! Just re-read this. First time was about 5 yrs ago and I'd slipped back into some bad habits. It's an excellent approach to discipline (vs. punishment) coming from love and respect. great advice and helps get into a teens head. it's helping us a lot!